The PMMN4084 is a noise-cancelling microphone with both 3.5mm threaded and unthreaded jacks. 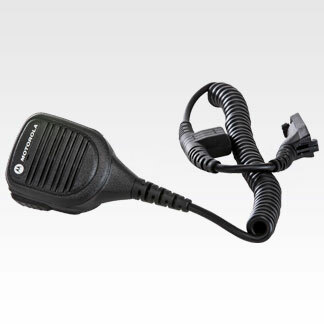 The 3.5mm threaded jack allows users to re-use key XTS-series surveillance accessories and earpieces. Noise-cancelling microphones are designed to reduce background sounds when working in crowds or near noisy machinery. To optimize its noise reduction capabilities, hold the microphone directly in front of your mouth, facing the source of the noise. This RSM is also rated intrinsically safe when used with intrinsically safe APX radios. They are certified and rated for use in classified hazardous areas where flammable gases or combustible dusts or fibers may be present. Whether you’re indoors securing a sports arena or working near a noisy pumper truck, you can trust APX audio accessories to extend the performance of your portable and deliver on their promise.